Speech Up is a mobile app that will bring fun and accessibility to speech therapy for kids. Nearly one in 12 (or 7.7%) of U.S. children aged between three and 17 have a disorder related to voice, speech, language, or swallowing, according to this survey carried out in 2012. While speech therapy empowers millions of children every year, it is not always accessible due to geographic or economic reasons. It can also be a somewhat tedious process. The innovative app takes a gaming approach to speech therapy through puzzles and challenges designed to help kids pronounce words correctly. However, as COO Steven Chen, Johnson Cornell Tech MBA ’17, explains, the ‘real magic’ is that Speech Up offers real-time feedback as the kids talk into the game, which no other speech therapy app does right now. The team behind the project are recipients of one of four Cornell Tech Startup Awards, which includes $80,000 in pre-seed funding and $20,000 worth of co-working space in The Bridge at Cornell Tech. Each member of the four-person team embodies part of Speech Up. Both CEO David Cheng, Johnson Cornell Tech MBA ’17, and CTO Luis Serota, Master of Computer Science ’17, grew up attending speech therapy. That personal investment makes Speech Up much “closer to home” says Serota. Cheng has a background in systems engineering, and industry experience with IBM and Deloitte Consulting. He handles the day-to-day workflow and direction of the company, but also works with Serota developing and building the app. Chen’s professional track record with companies such as Disney and Kabam adds mobile games expertise to the mix. The fourth team member is Chief Product Officer (CPO) Eliza Bruce, a 2017 MFA graduate of Parsons School of Design , who met her teammates through a collaboration between the two institutions. Bruce leads Speech Up’s design and creative direction, and also brings valuable experience in clinical research. This dream team first collaborated as classmates tackling businesses challenges during Product Studio in the fall, where they worked on a Google research project. There was great team chemistry, says Cheng, and it made sense for them to continue to work together during Startup Studio in the spring. While other teams rearranged after Product Studio, Speech Up felt like they’d struck gold. “We had such a good experience that we decided to stay together and work on our studio project together,” he explains. 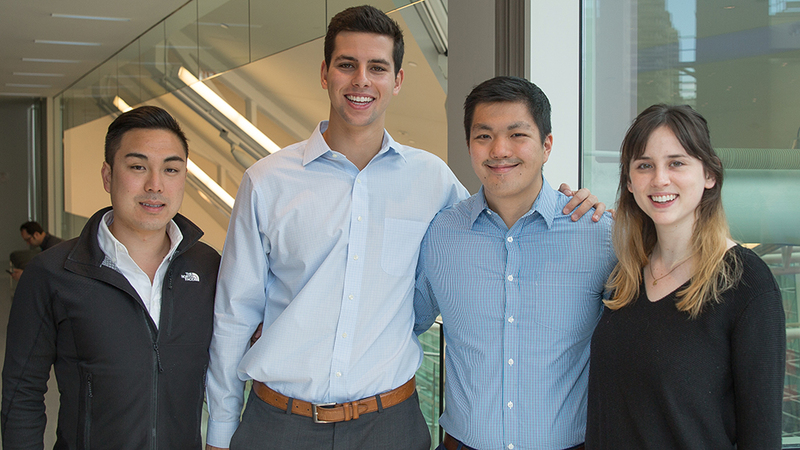 The Speech Up team (from left to right): Steven Chen, Luis Serota, David Chang, Eliza Bruce. This combination of personal and professional experience allowed the team to develop a very strong focus for Speech Up. The goal was to make the app accessible, affordable and engaging, as well as offer real-time feedback based on scientifically-based speech therapy methods. Accessibility is essential, says Cheng, who points out that both he and Serota feel fortunate to come from backgrounds with the geographical access and financial resources to attend speech therapy. Technology, he says, creates a more even playing field. Speech Up will support underserved kids who don’t have access to speech therapy — be that due to geographic or economic circumstances. Even kids who do have access to speech therapy, he continues, often only attend thirty-minute sessions once a week as it is expensive and there is a shortage of speech therapists. Speech Up will provide an accessible platform that allows kids to practice at home. For Serota, it is especially important to create something that kids will enjoy. He recalls the drudgery of his own speech therapy, “When I was a kid, I hated having to go home with papers and spreadsheets to do all the time.” It was “onerous.” Now he is relishing the chance to build a fun environment that will be a resource for speech therapy going forward. The award is particularly meaningful to these four entrepreneurs as Speech Up is so built-in to their backgrounds in one way or another. It is a once-in-a-lifetime opportunity to “shoot for a dream that we all have” says Cheng.